I was stressing over a pile of dump truck tires and a pile of broken up concrete, rock, and brick that had been in the yard for years. Hauling this stuff to the landfill really wasn’t the problem. What it was going to cost me to dump it was my concern. Well, in my household, I’ve convinced my family that it is against the law to not recycle (hee hee). My 13 year old was trying to think of ideas for these tires – tire swing, shred for playground, boat bumpers at lake, etc. Unfortunately, these tires have steel in them, so their re-use is limited. Placing this on the back burner and moving on to the creation of our 1st garden, the idea hit us like a ton of bricks to use the tires in the garden. We drilled a hole, then jig sawed the sidewalls out of the tires, placed them against the hill, filled them with potting soil and carolina clay and planted tomatos in them. We placed the broken concrete and rocks on the hill behind the tires. We liked this idea because tire disposal is a huge environmental problem. Landfills won’t accept them and so using one as a raised bed seemed like a great idea to us! Katie Matz suggests that teachers use both sides of the paper before recycling so that the paper filling up recycling bins would be used completely. She also suggested that teachers send assignments and receive homework via email to save paper. As she says, “Less paper equals more trees, more trees equals more wild life living in rainforests, including those cute and slimy frogs.” We agree! 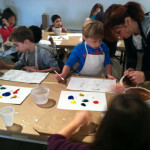 Lisa Crain-Butler: Lisa suggested ideas for celebrating her daughter’s Earth Day birthday (happy birthday, Madalie! ), including planting a tree, giving her a set of gardening tools, and creating a birthday garden. She also has great ideas for reusing cans and other materials. Kristine Garcia: Kristine’s idea is to skip the mall and go to a park instead and make it fun by creating nature scavenger hunts. We all definitely need to spend less time in the mall and more time outside so this is a great idea! Trish Szymanski suggests forming neighborhood associations to remove those items that can’t be left curbside for recycling. This is a big problem in cities. I have a whole basement full of this type of material. Linda Labowitz suggests saving lids from plastic bottles and using them for drainage at the bottom of flower containers. Mix compost and potting soil to put on the top of plastic lids. I’m going to try this with my garden plants. Nancy Rielle suggest reducing paper waste by sending paperless e-cards. She points out that 7 billion paper cards are sold annually in the U.S. That’s a lot of paper! Robin Rhodes suggests spending more time in the natural world. Say good morning to trees and plants, talk to the birds, pray with the wind. As she says, relationship is one way to increase your connection and commitment to nature. Mary Jo’s idea: I have an old-fashioned idea. Buy or make a bird bath and put it in your backyard. Our grandparents often had bird baths, yet so few people seem to have them now (at least around where I live). I love watching birds splash and drink in the bird baths in my backyards. Birds need water (and other creatures, like bees, do too). It’s such a simple way to reconnect with nature. Just be sure to pour fresh water in every day and clean out your bird bath every couple of weeks. Perhaps tires could be reused as bird baths! 1- How about reusing the sleeve from your coffee cup? Each time you go to Starbucks or Dunkin Donuts, take the sleeve off the cup before you trash it and reuse it on the next cup. Perhaps we can convince these coffee bars to start a recycle bin for the sleeves. 1- How about reusing the sleeve from your coffee cup? Each time you go to “Starbucks” or “Dunkin Donuts” take the sleeve off the cup before you trash it and reuse it on the next cup. Perhaps we can convince these coffee bars to start a recycle bin for the sleeves. 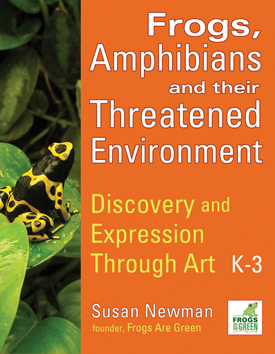 We would like to send to honorable mentions a few of our postcards of a red-eyed tree frog and a wristband. If you’re interested, please send your address to us. Even if you didn’t enter the contest, we’d love to receive your ideas. Feel free to suggest some more ways to renew, reuse, reconnect, rethink, rebuild or recycle in the comments section. And be sure to go outside today and enjoy nature—wherever you live! 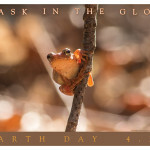 Celebrate Earth Day & Enjoy PLANET EARTH For FREE! 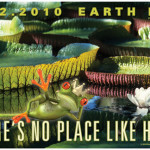 This entry was posted in Earth Day, Frogs Are Green contests, How You Can Help and tagged birthday on earth day, Earth Day 2010, Earth Day 2010 events, Earth Day contest, emailing homework, environmental clubs, make a bird bath, nature scavenger hunts, planting trees, ponds for frogs, rebuild, reconnect, recycle coffee cup sleeves, recycle paper, renew, rethink, reuse dump truck tires, reusing plastic bottle caps, reusing tires in gardening, send e-cards. Bookmark the permalink. Can toads (and other animals) predict earthquakes?